Thanks to my two daughters, I have years of experience in fixing their hair. Coincidentally, one of their favorite hairstyles is messy pigtail topknots, which just so happens to look like little ears! Lily requests this hairstyle most often, and I'm happy to oblige, because it's quick and easy to do! Brush out the tangles, make a middle part the entire way back with a comb, and pull hair into high pigtails. Twist each pigtail into a loose bun, and secure around the base of the pigtail using a hair elastic. Lightly loosen and tousle each bun. Add a bow to each bun to change those "Mickey Mouse Ears" to "Minnie Mouse Ears!" See how easy that is?!? VOILA...your own ears! And it's definitely adorable! 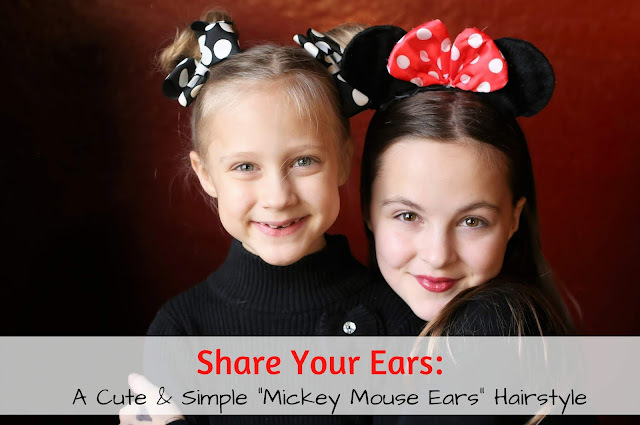 How can you join the Share Your Ears movement and help make a difference? 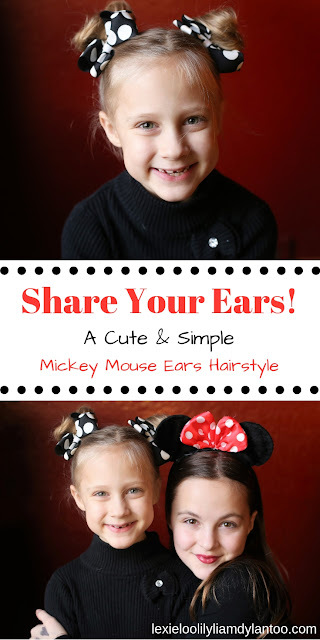 Show off your "ears" on Facebook, Instagram, and Twitter now! Upload your picture, make sure your post is public, and use the hashtag #ShareYourEars! From November 18th-November 27th, 2018, Disney will donate US $5 for each share, up to US $1 million! The holiday season is our favorite time of the year, but I always encourage my kids to give back as much as they possibly can. We have so many fun holiday traditions, and making it a "season of giving" is one of them. Giving always makes the season more special! Join the Share Your Ears movement now! Great cause! I tried to put my own hair up in buns like that but I couldn't get them even! Aw, your girls are too cute. I love this idea, and that Disney is giving back so much for each picture! Your girls are getting so big! And that hairstyle is perfect for a little girl who loves Mickey! Oh my goodness! This is such a sweet way to give back! Love it!!! This is precious. I can't believe how big your girls are getting. They both look so grown up here! What a cute idea for a wonderful organization. Lily and Lexie look so cute sporting their "ears." Too adorable!